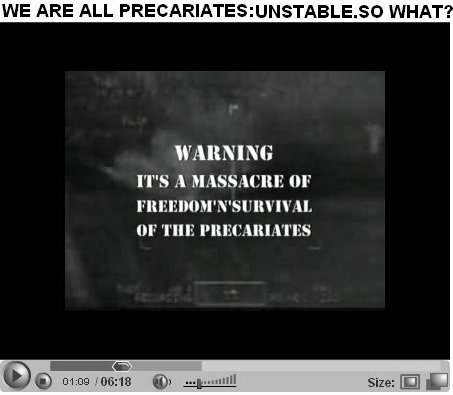 WE ARE ALL PRECARIATES: UNSTABLE, SO WHAT? c/o 「3人デモ」"WE ARE THE THREE (ONLY!)" In April 30, 2006, "MAY DAY Demonstration for Freedom'n'Existence 2006" held at Tokyo, JAPAN with about one hundred "precariates". During sound demonstration, three people were arrested unjustly and a truck with sound system was robbed by police, in charge of V.R.T.L. (Violating the Road Traffic Law) & I.P.E.D. (Interfering with Policemen in the Execution of their Duties). This suppression against the MAY DAY is nothing less than busting up freedom and survival of precariates. This is unauthorized PV against suppression at MAY DAY Demonstration. The three arrestees were respectively released on May2, 9, and 11. None is prosecuted now; however, it does not mean that the three are finally exempted from prosecution, but released simply because the prosecutors suspended deciding whether to charge them criminal penalties or not. Although many such cases would end up without further prosecution, the former arrestees are still placed in very awkward positions. Please pay your attention to the development of this Mayday incident and be patient while the appearance of new information in English delays.